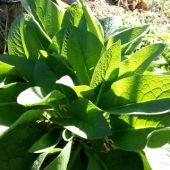 Comfrey is a perennial herb that produces continuous cut and drop mulch. The deep roots draw minerals from the soil that other plants can't reach up into their leaves. The leaves have a high N:C ratio and won't cause nitrogen draw-down when applied directly. Requires supplemental nitrogen, such as manure, to grow best. 8 seeds per packet. Sequel is an open-pollinated Lucerne variety. Nitrogen-fixing, Winter growing legume. Bushy perennial with purple flowers that attracts bees and beneficial insects. Shred stems and leaves to make a nitrogen-rich mulch or use for animal fodder. Seeds can be used for sprouting alfalfa. 4250 seeds per packet. 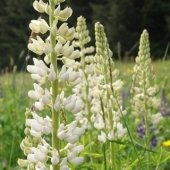 White-flowered variety of Lupin. Can be used as a nitrogen-fixing green manure between crops or just planted here and there to attract bees to the garden. Long taproot good at breaking up soil. Annual. 50 seeds per packet. 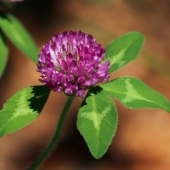 Red Clover is a short-lived perennial with tight, round clusters of small pinkish-red flowers. The flowers attract bees to the garden. Nitrogen-fixing legume which can be used as a green manure between crops or to restore beds that are depleted of nitrogen. 10-12 weeks to maturity. Approximately 4900 seeds per packet.